Grunt Style, an ‘Merican company from Illinois has partnered with Seven One Tactical to offer a one-time-per-person use coupon code for their web page. http://www.gruntstyle.com/ to save 10% off your order. Grunt Style offers a wide variety of items from mens and womens t-shirts and other clothing items to gear and swag. If you are looking at having custom t-shirts created, Grunt Style can do that as well. Head over and check them out. CLICK HERE. Smith and Bradley, an American-Made Watch Manufacturer, is now a sponsor of ZERO7ONE.com. The S&B watches are built to not only last your lifetime, but to pass onto your future generations. It is time that you have a watch on your wrist that feels like a watch, not a happy meal toy. For more information on their full product line and to order, please visit: http://www.smithbradleyltd.com/. Combat Shooters has started their customer appreciation sale. 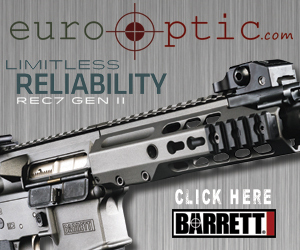 The sale includes their basic 16″ Patrol Upper with a QPQ (aka Melonite or Nitride) barrel. You can also get a discount on their new 12″ GPX Rail System. Combine them both and use the third listed discount code. Check out the details for the sale below.